I am sitting by the front windows at a table adorned with a small vase of fresh-cut daisies and miniature yellow roses, clacking away at my laptop while sipping from a large mocha espresso. It is mid-morning, well after the breakfast rush and still more than an hour away from the onset of the lunch crowd, yet there has been no scarcity of customers. An ebullient woman dressed as a skeleton and a cocky guy in the garb of a Mardi Gras king are competing for the approval of the audience as Let’s Make A Deal unfolds on a flat-screen display. No one pays any attention to the spectacle, though, its raucous proceedings muffled by the general din of conversation and an industrious, cheery staff. 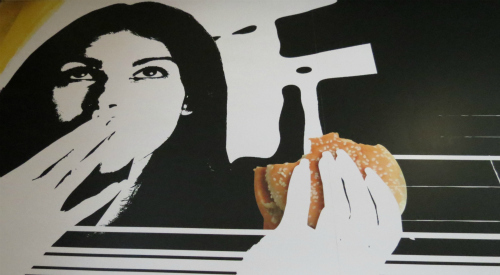 The dining area is a collage of browns, beiges and oranges, offset with bold murals of modern art featuring swaths of black and white, red and yellow, and a high-contrast, monochromatic portrait of a young woman of ambiguous expression staring upward as her negatively silhouetted hand cradles a photorealistic hamburger. Behind the counter is an even more aggressive design scheme: yard-long, rectangular backsplash panels in adjoining fields of midnight black and fire engine red. A light wood grain laminate dominates not only the floor but the walls as well. Unobtrusive lighting recessed within acoustical ceiling tile illuminates a variety of seating options, from a long, tall, wooden table flanked by a dual row of upholstered bar stools to a series of white fiberglass tables adjacent to a long, cushioned bench that runs along the front of the room. It’s a quirky mix of variety and uniformity, as though an interior decorator were given complete artistic freedom within severely defined constraints. Another customer approaches the owner and reveals that her daughter was impatiently awaiting the grand reopening. “Look how happy she is,” the mother indicates, adding her glowing assessment of the remodeled interior’s beauty. I swear on Ray Kroc’s grave that I am not fabricating this exchange. Of course, I understand the attraction of McDonald’s for young children. I am of the first generation of toddlers to have been wooed by the burger chain’s successful McDonaldland advertising campaign, the bizarre series of commercials that emulated the work of Sid and Marty Krofft and introduced such memorable characters as Grimace and Mayor McCheese. I am told that I once barricaded myself in the bathroom, taking advantage of a design flaw that enabled anyone to simply open the counter drawers to prevent the door from being opened. For reasons unknown, I refused to come out despite the patient pleading of my parents. Apparently I was finally persuaded to abandon the standoff when Dad promised to reward my compliance with a trip to McDonald’s. I’m not sure what the moral of the story is (probably not a good one), but I think my estimation of McDonald’s was similar to that of many children at the time. Those golden arches supported a powerfully positive connotation. My wife and I continued the tradition by taking our daughters to McDonald’s when they were very young. They liked the food and loved the play areas, a winning formula that guaranteed a good time at minimal expense. And there is something to be said for consistency. One of the redeeming virtues of McDonald’s is that you can walk into one practically anywhere and know precisely what you’re going to get. If you happen to have a craving for the unique flavoring and texture of, say, a Big Mac, you are not going to be disappointed. But I do wonder if I would be totally ambivalent to the food McDonald’s sells if only my brain were not hardwired to associate it with the happiness of my childhood and that of my children. Sure, the fries can be pretty tasty, provided they have been culled from a fresh batch. But have you ever made a hamburger that was even remotely like any of the billions sold by McDonald’s? That curious mixture of meat, condiments and bun is so effortlessly digestible that you could lose all your teeth and still gum down a Quarter Pounder. It’s unlike food I’ve consumed anywhere else, and that’s a plus for McDonald’s, because there is only one place to get it. I suspect that had I never entered a McDonald’s until today, I would sample the menu and be appalled. But I have been conditioned to respond otherwise. I occasionally eat at a McDonald’s and more often than not enjoy it. Today, in fact, my espresso is merely an appetizer, allowing me time to soak in the new atmosphere and enjoy a couple hours of complimentary WiFi service before my wife joins me for lunch. Plus, I am curious to check out this new McDonald’s philosophy of encouraging customers to linger, as patrons are accustomed to doing at Panera. True to their corporate word, no one hassles me for occupying my seat for so long. In fact, they seem nothing if not pleased to have me there. My wife arrives, and we both settle on the classic combination of a Big Mac and fries. One of the highlights of my sixty-first birthday celebration was when Tricia suggested we needed a ‘break’ on our drive to Palm Springs, and we turned in at McDonald’s. I had heard for years from our girls that the ‘Big Mac’ was really something special, and while I’ve often credited Mrs. Nixon with making the best hamburgers in the world, we are both convinced that McDonald’s runs a close second. If only our late President could see the slippery glop that I hold vise-like with both hands now. Sure, it tastes good, in a McDonald’s sort of way. The fries, alas, are not a fair representation of the best McDonald’s has to offer. The staleness that sets upon them like french fry rigor mortis has already begun to lessen their appeal. Our surroundings are more pleasurable than the food we are eating. We’ve all been there, I think. And in that sense, you’ve already been to one of the renovated McDonald’s. Only the environment has been changed, not the food, and it remains to be seen whether a billion dollars worth of remodeling can persuade enough consumers to feel that the big,yellow M stands for more than Meh.